¡ No me quiero ir a la cama ! 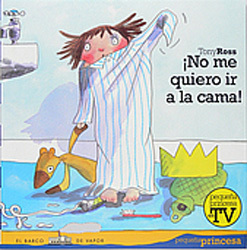 Spanish-language edition of I Don't Want to go to Bed! The Little Princess doesn't want to go to bed! This book will delight all youngsters. The simple sentences will help to develop early Spanish-language skills. No me quiero ir a la cama is written entirely in Spanish and so it would be necessary for the parent or child to have a reasonable knowledge of Spanish. There is no translation or pronunciation guide included because this is aimed at native Spanish speakers. ¡ Lávate las manos !